A French citizen, Christian was born in Morocco, and lived in India, Belgium and Luxembourg, before settling in Provence. After studying architecture and business in Marseille and Paris, he worked as an architect specialising in Roman and Greek marine archeology - the subject of his very first book, published in 1976. He then moved into industry and joined a major petroleum company with whom he travelled around the world for many years. His observations and experiences from this time formed the basis of a number of award-winning short stories, as well as his first novel, Lignes de terre, which was published in 2011. He also continued to write non-fiction and in 2013, his biography Clot Bey, médecin de Marseille, was awarded the Prix Félix de Beaujour by the Academy of Marseille. His second work of fiction, a novella Le Pneu was self-published in French in 2015 and he jumped at the chance to work with Liz Huntley on writing an English version. Christian and Liz both share a passion for travel, a keen interest in cultural differences and a love of great stories that follow a classic narrative arc. 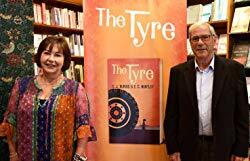 Peter: I was fortunate to read an Advanced Reader Copy of your book, The Tyre, in early May this year. It was a wonderful book that provided not only an entertaining story but a moral message and an insight into the Untouchable class in India. I am delighted that we have the opportunity to conduct this interview and many thanks for making the time available. Liz: My pleasure Peter. Yours was one of our very first reviews and I was thrilled that you enjoyed reading it. I have also asked my co-author Christian to contribute to the interview with you. Peter: How did you come to write The Tyre with Christian Dubois? Liz: I first met Christian many years ago in the 1980s when I was teaching English as a foreign language and Christian was one of my students – he needed to improve his English for his job heading up the French subsidiary of a large oil company. We had got on well but lost touch and then a couple of years ago, a chance to meet up again presented itself and our friendship was reignited. In the intervening years, he had retired from the industry and had become a successful published author in his native France. 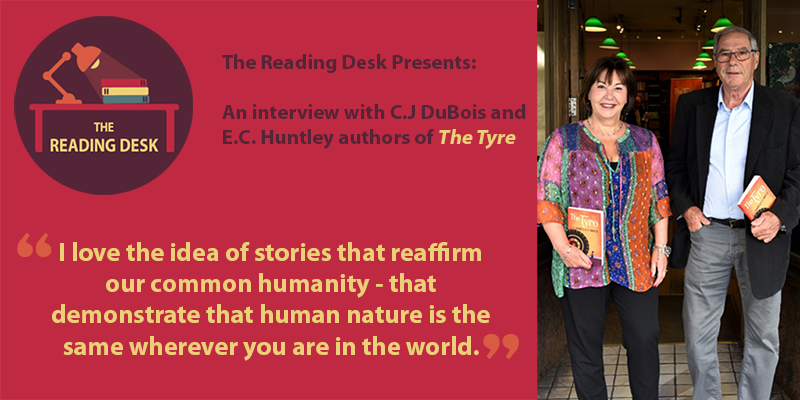 We talked about his writing and I became enchanted by one particular story – “Le Pneu,” set in Tamil Nadu in India. I loved this charming tale, almost a fable, about hard working Ranji who just wanted to provide for his family and improve their lives – it really caught my imagination. I started talking to Christian about creating an English version of “Le Pneu”. I felt sure that the story would appeal, but I did not feel that as it stood it would be right for English-speaking readers. We talked it through…. and the project started to grow. We discussed how we might re-structure the story. We speculated about what might have happened in the past to bring the characters to this point. Some new characters emerged, new sub-plots too. We agreed that readers would love to know more about the son who left to seek work in the city – a very minor figure in the original. Passages were cut and new ones added. And slowly a French novella morphed into an English novel. Peter: What was your main inspiration behind telling this story and publishing a novel? Christian: My family lived in India when I was a teenager and I remember one occasion when I was sitting alone in the back seat of my father’s car. We had stopped in a traffic jam on the outskirts of a small village. One small boy who must have been seven or eight, dressed in filthy shorts and a tattered long-sleeved shirt, much too big for him, peeped through the window. I looked at him; he stared back at me, and I have never forgotten his reaction: He lowered his head to look at his shirt, and then quickly buttoned up the single button remaining on it. Then he looked back at me again and smiled. Ever since then I have wanted to pay tribute to this child who lived in poverty but still showed some pride. But I didn’t quite know how. A few years ago, returning to Tamil Nadu, I have to admit I was shocked to discover that such poverty is still very much a thing of the present, despite India having become a major player in computers and high tech communications. But even so there is hope for hard working untouchables: 3000 of them are now millionaires I believe! I started to write this story when I returned home: a tribute to the nobility of people poor in material possessions. Peter: I felt there was a moral message in The Tyre. Would you agree and if so how important was this in the overall novel context? Liz: I would say that it is about hope and the fact that hope is always present! I love the idea of stories that reaffirm our common humanity – that demonstrate that human nature is the same wherever you are in the world – that love, loyalty, grief, even obsession and despair are experienced the same whether you are rich or poor, whether you lead a privileged life or face unimaginable challenges just to survive. Peter: You have created several main characters. Who was your favourite and who was the most challenging to develop, and why? Liz: I know that Christian related strongly to the main male character Ranji but my favourite character was certainly Meena. As an untouchable and furthermore as a woman her horizons were always going to be very limited but we enjoyed creating her as a strong character dealing with the conflicts of her feelings and the frustrations of her situation. The most difficult thing perhaps was to combine fantasy and the sad reality of the family’s impoverished life without it becoming depressing. Peter: The societal and class inequalities, and particularly the “untouchables” were starkly presented in the book, how much research was undertaken in this area and what surprised you most? Liz: Christian spent many of his formative years in India and feels a huge affinity for the country, but it can’t be denied that Indian culture can be baffling for Europeans – in particular, the persistence of the caste system. After all, the “untouchable” Ram Nath Kovind became President of India last year which would seem to send out a very strong message that things have changed – and yet millions of untouchables are still denied the opportunities of their fellow citizens as a result of their caste. We both read a great deal around the issue but in the end, the greatest research tool is probably your imagination. Peter: Do you use storyboarding or mapping processes to develop your plots and interactions, or do you go with the flow and follow your instinct and gut feeling? Christian: A basic framework guides the story, but situations and secondary characters come along during the writing process. Sometimes they might appear one night and finish up in the rubbish bin two days later because I realised they were not adding anything important to the story. The ratio for me tends to be a minimum of five pages written for every one kept so you can see that a lot of ideas are developed only to be discarded soon afterwards. Christian: Usually I write early in the morning for about three hours, but that depends very much on whether I feel inspired or not! Liz: For my part, I can’t say that I was that disciplined about it. I did tend to fit it in as and when I could. I found I was able to use train and plane journeys for writing, and often wrote during the evening if I was alone. As I was adapting the story from the original French I found that I could do different things at different times – the initial straightforward translation to tell the tale was simpler, but the next part: working on the style and developing the story beyond the original tale required more discipline and concentration. Peter: Did you always feel that writing was a path you would take? Liz: Both Christian and myself have had full-time jobs for all our working lives – Christian in the oil industry, myself in sales and marketing – and though we have both always written to a certain extent it has very much been in our free time. Once Christian retired he had more time for writing and dedicated more time to it though. Christian: To name just a few: the recently deceased V.S Naipaul, the poet Rabindranath Tagore, the Chilean writer Francisco Coloane, Gabriel Garcia Marquez – of course! Jean Giono, a French author who wrote many wonderful works of fiction set in my part of France (Provence) and the contemporary writer Laurent Gaudé. Liz: I too also loved Gabriele Garcia Marquez and other Latin American authors such as Isabel Allende whose ability to mix fantasy with real-life captivated me. I adored the books of Edith Wharton and admired the way she broke the mould of what was expected of a woman. For a light read I always enjoy the tales from Alexander McCall Smith’s Number One Ladies Detective Agency – satisfying stories populated by appealing characters set in an exotic location – in this case Botswana. This was very much what we tried to achieve with The Tyre. Peter: What is your favourite book you’ve read this year? Liz: One book I loved this year was Home Fire by Kamila Shamsie – very of the moment and a great story. A truly fascinating exploration of family, faith, and betrayal. I didn’t realise until afterwards that it is actually a modern-day version of the story of Antigone. A very different book I read with great interest was Leila Slimani’s Lullaby – a haunting tragedy that goes straight to the heart of the worries of well-off working parents who decide to leave their children with childminders. This is a book which stays with you long after finishing it. Liz: Write because you enjoy it – not because you feel you should. And in terms of the book itself – make sure that you are telling a good story. The style is, of course, important but it is the story that needs to hook and entrance your readers. And maybe also: don’t give up the day job! I think it is rare to be able to make a living from writing but it is a wonderful thing to combine with another profession. Peter: What are the greatest benefits and restrictions of being a published author? Liz: It is wonderful to know that others (especially complete strangers) can read what you have written and be moved by it. That feels like a tremendous privilege to me. If you are asking about being published by a publisher rather than self-published, that is harder to answer. I guess the benefit is that someone else feels your work is worth investing in and that gives you confidence. It also means that someone other than yourself is invested in the book’s promotion and in bringing it to as wide an audience as possible. The obvious restriction is that you lose some knowledge and control – it is difficult to assess the impact of any promotion without immediate access to sales figures. 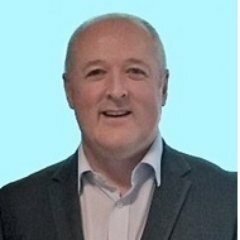 Peter: As a published author how involved are you in finalising other aspects of the book, for example, the cover design, narration and the promotion of the book? Liz: I am sure this varies a lot but talking from my personal experience I can say I was involved in writing a suggested brief for the cover and I was sent the final cover for approval (which fortunately I loved!) Thistle Publishing has also encouraged me to do as much promotion as I feel comfortable with. I have learnt a lot during the process and I was very grateful for the initial platform that Thistle gave the book by engaging with reviewers and book bloggers such as The Reading Desk. For me, it was wonderful to learn there are so many book lovers and writers who will generously support authors and help them gain a profile if they have enjoyed their books. Liz: It is true that promotion can take up a lot of time and it is important to get the balance right. But as someone who has worked in sales and marketing most of my life, I know that time has to be dedicated to this side of the publishing process. It is a lot of work to write a book and then get it published and I personally am very grateful for any opportunities that I am given to bring the finished book to the attention of more people. The first few months after publication are obviously vital and I have to say this time has been much more dedicated to promotion than to writing! Peter: How important do you feel narration is or will become to the book industry? Liz: I have been delighted to see so many of my colleagues at work devouring fiction in this format (as well as non-fiction). It seems to be something that is here to stay and I can certainly see the appeal. I can only see this growing and it will be interesting to see how this develops. We are currently discussing with Thistle an audiobook of The Tyre which I hope will be available early next year. Liz: We are currently working on a sequel to The Tyre which follows the lives of Ranji and Meena’s grown-up children a few years after the novel ends. But we’re not giving any clues yet! Peter: Liz, it was a delight to talk to you and I appreciate you taking the time to answer these questions. If there are other snippets of information you wish to provide, please feel free. I would like to congratulate you on your wonderful book and I wish you massive success for the future. Liz: Thank you so much, Peter. It has been an absolute pleasure talking to you. I am very grateful for this opportunity to tell you more about The Tyre and how it came to be!